Recycling labels that make sense. Information is provided to ensure the proper steps are taken to effectively recycle materials. Rinse & Insert Lid: Rinse your container out, and then stick the lid back inside the container. You can do this with all metal cans. Empty & Replace Cap: Before recycling your item, make sure it's empty and then screw the cap back on. Always caps on! Empty Before Recycling: Make sure your container is empty before you recycle it. No need to rinse. Rinse Before Recycling: Just a quick rinse and recycle it! Rinse & Replace Lid: Rinse the container but then be sure to put the lid back on! Recycle If Clean & Dry: Before you recycle this item, throw away or compost any remaining product inside and make sure it isn't sticky or wet. See Website for Cap/Bottles: Certain caps and small packaging are too small to make it through a recycling facility. Ask your drop-off location if they accept loose caps, or send your plastic caps to Terracycle or Gimme 5. For glass beverage bottles with small, crown shaped metal caps, it's best to collect them in an emptied soup can. Once you have filled the can, squeeze the top closed and toss it in your recycling bin! Remove Label Before Recycling: This means for this specific package, your container won't be recycled properly unless you remove the label first. Empty & Discard Sprayer: This means before you recycle your bottle, make sure you remove the sprayer. This usually means the sprayer contains metal parts. Empty & Reattach Sprayer: This means before you recycle the bottle, make sure it's empty and reattach the sprayer. For this packaging, the sprayer is recyclable! Empty & Discard Pump: This means before you recycle your bottle, make sure you remove the pump. This usually means the pump contains metal parts. Empty & Reattach Pump: This means before you recycle the bottle, make sure it's empty and reattach the pump. For this packaging, the pump is recyclable! Information and locational instructions let you know if an item can be recycled traditionally or by other means. Widely Recycled: At least 60% of Americans can recycle this package at curbside recycling or drop-off recycling. Limited Recycling: Between 60% and 20% of Americans can recycle this package at curbside recycling or drop-off recycling. Check your local program. Not Yet Recycled: Either less than 20% of Americans can recycle this package, or, it could cause a problem in a recycling facility. Store Drop-Off: Anyone who lives near a store that accepts plastic bags and wraps for recycling can take this packaging to that store and recycle it there. Lists what type of material the packaging is made from. Plastic: This helps you know exactly which part of the packaging we're telling you to recycle. Paper: There are many different kinds of paper. With How2Recycle, you don't have to worry which kind of paper something is in order to know how to recycle it. 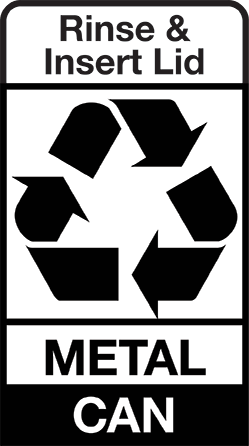 Metal: In How2Recycle, metal encompasses both steel and aluminum. You don't have to worry about what's what! Coated Paper: Coated paper means that it's paper that's been coated on one side with plastic. Glass: This helps you know exactly which part of the packaging we're telling you how to recycle. Multi-layer: This material is actually a mix of materials. Often it will be layers of different types of plastic, or layers of plastic with aluminum. Information on what parts of the packaging needs to be recycled in this specific way. Bottle: This helps you identify which part of the packaging we're referring to. Tray: This helps you identify which part of the packaging we're referring to. Insert: This helps you identify which part of the packaging we're referring to. Box: This helps you identify which part of the packaging we're referring to. Bag: This helps you identify which part of the packaging we're referring to. Wrap: This helps you identify which part of the packaging we're referring to. Can: This helps you identify which part of the packaging we're referring to. Film: This helps you identify which part of the packaging we're referring to. Pouch: This helps you identify which part of the packaging we're referring to. We want to be sure that you know how to recycle your whole package, not just a part of it! For a How2Recycle label like the one at right, each "tile" represents a different part of the package. 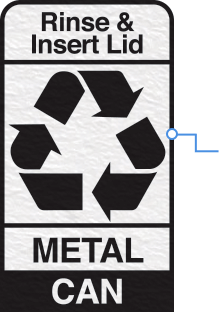 This is really helpful for when you're trying to know how to recycle different parts of your package. 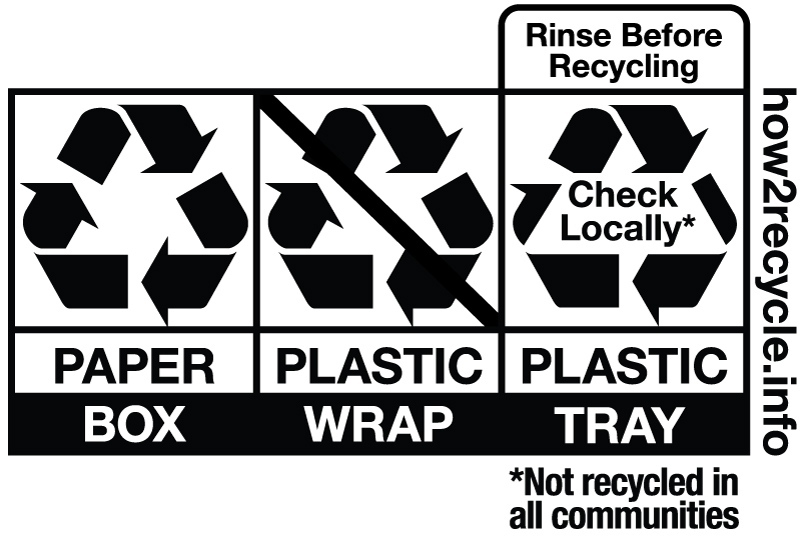 How2Recycle labels are intended to be read left to right, based on which part of the packaging you encounter first.